Professional diagram software for event planning is a critical component for event pros today who are looking to streamline their processes and use digital planning tools for their event floorplans. AllSeated is the world’s most innovative event planning platform which caters to the needs of event professionals looking to digitize and streamline processes while working with their vendor teams and clients to create memorable events. A professional diagram software program like AllSeated provides event professionals with digital organization, operation efficiency, and collaborative tools to best achieve their planning goals while saving time in the process. AllSeated’s professional diagram software program provides opportunity for users to create floorplan layouts to-scale. With one in every ten events in America created within the AllSeated platform, it’s easy to locate your venue’s floorplan template in our system. In the event that you cannot locate the venue floorplan template for your specific venue, you can provide us with a floorplan marked with at least one accurate dimension and our team will scale and upload it into the AllSeated platform. From the furniture library, select the tables, furniture, and objects you wish to use to create the floorplan diagram for your event. 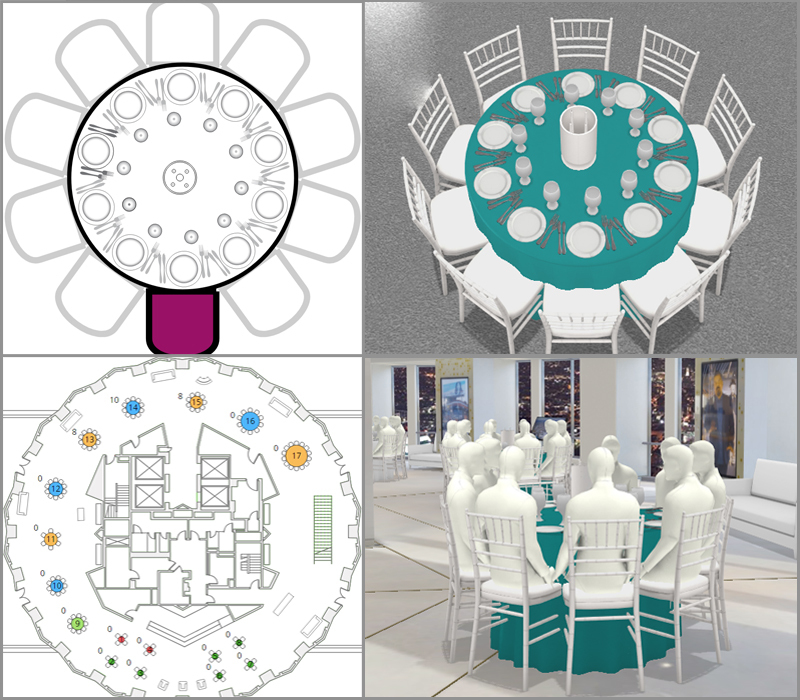 AllSeated’s collaborative floorplan tools allow for personalization such as spacing between tables, number of chairs around each table, table numbers, and table assignments. All of these details can be modified at any time while designing your floorplan. Easily switch between 2D viewing and 3D viewing during the floorplan design process. AllSeated’s 3D options, Bird’s Eye view and 1st Person view, allow you the flexibility to see your 3D floorplan from various points of view to ensure you are happy with your final diagram. AllSeated’s professional diagram software provides you with the ability to easily generate reports regarding the details of your event. Filter the reports according to the details you need for your event planning needs. For example, you may wish to generate a floorplan report to detail your specific layout along with complete listing of inventory, table breakdown, and seating information. Valuable features of professional diagram software for events are guest list management and seating chart tools. Provide your clients with the added value and benefits of AllSeated’s guest list. Guest list features include guest name and mailing address organization, easily stored alphabetically with the option to filter for into specific categories based upon the event’s needs. Guest names can be entered manually or imported from Facebook or Excel. The guest list also includes sections for notes, meal type information, and RSVP tracking. With direct link to seating, it’s really simple and efficient to seat guests within the event floorplan diagram. Drag and drop your guests at the desired tables within the floorplan, with the option to seat guests at specific seats at specific tables if needed. It’s easy to play around and move guests from table to table until reaching the desired seating chart! AllSeated’s professional diagram software program allows you to build tabletop and buffet displays to-scale within your floorplans using designer tools. The designer tools let you to see exactly what fits to-scale on the tabletops in your floorplans which means no more guesswork! The table builder and buffet designer tools currently include options for place settings, flowers, centerpieces, linens, and buffet pieces, with many more objects to come. Watch this quick video about our designer tools! Experience the event before it even happens using AllSeated’s virtual reality technology. AllSeated’s special virtual reality goggles allow you to tour your future event layout in a realistic simulation. Learn more about AllSeated’s Virtual Reality in this video and the three easy steps for getting started here. AllSeated VR technology is event industry’s first/only genuine virtual reality capability. AllSeated’s VR offers seamless 3D renderings, sending customers on a virtual walkthrough of your venue from anywhere in the world. AllSeated’s Day-Of Mobile App for tablets includes a mobile check-in system, real-time collaboration, live check-in updates, overview of check-in status, and the ability to view floorplan diagrams in both 2D and 3D. The Day-Of Mobile App gives you access to the master seating chart and allows you to let your guests know where they are sitting while also keeping track of who is in attendance.